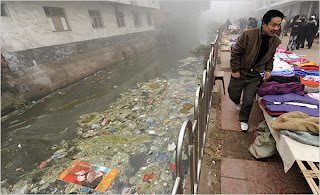 The Chinese government is admitting to having waterways that are at least twice as polluted as previously reported. This shouldn't surprise us because we hear of serious incidents where major cities forbid using water from the rivers on which they are situated because of spills of toxins and other environmental problems. With a population well over a billion people it's hard to imagine how governments can ensure safe water supplies. I got thinking about the stuff I own which comes from China. I have a guitar from China because it is good quality but much cheaper than one produced in North America. I have a jacket which I have worn for 15 years which comes from Mountain Equipment Coop. Their goods are always top quality and long-lasting. Guess where it was made? Of course, China has become a country of factories which pollute the air and the water and the soil. My inexpensive stuff has a high cost. It seems to me that we need to be honest in recognizing that someone is paying the price we aren't willing to pay. I'm reading a book called The Value of Nothing by Raj Patel, which takes its title from an Oscar Wilde observation that "we know the price of everything and the cost of nothing." Patel points out that we encourage unsustainable economies which are harmful to the planet. As I am preparing the last sermon in our Ten Commandments series I am thinking about what it means not to covet. I realize I shouldn't hanker after cheap stuff at someone else's expense. These workers and producers may live on the other side of the world, but it is the only planet God has given us, and we are asked to care for it. Do you ever feel uneasy about an "out of sight, out of mind" approach to consumerism? Can we do anything about it? Along the lines of sustainability, I had an interesting conversation last night on the way to soccer with my friend Ryan, a trained geologist. Ryan ran salinity tests on the creek water running behind his house in Whitby and found out that the creek is essentially a salt water waterflow. The reason? Oversalting of the streets during the winter time has caused the runoff in spring to be completely hazardous to that ecosystem. This is the cost of one of the things we take for granted. This salination also (ironically) destroys all attempts by Environment Canada to restock local fish supplies. What are we doing to ourselves? And, why do we not seem to notice or care? It seems that every decision we make is so much more complicated than we suspect. It's hard to balance conscientiousness with simplicity. It seems that as we learn to live with more interconnectness we can't help but grow more aware of the power of our actions, even the simple actions of buying the best buy, and the impact it has on other people who we will never meet, on the places they live, and ultimately on the planet. Both of you have offered thoughtful reminders that we are must contend with challenging and complex situations, often without much that is obvious at first blush. We drive past the stream and don't give much thought to what is being sluiced into it, we get a great deal on a consumer item and congratulate ourselves for being discerning shoppers. Your comments suggest that there must be a sense of responsibility for those of us who are priveleged, even when our lives are hectic and there doesn't seem to be much energy left at the end of each day to be well informed.